I can’t believe how quickly April Fools snuck up on me this year! I love playing pranks and I had good pranks lined up for my suitemates, but April 1st came so quickly I didn’t find the time to plan out my best pranks. (Which I will be saving for another year.) But, I was not going to let the day go by without at least a little something. So, I decided to play the prank that my mom played on me a couple years ago – Oreos filled with toothpaste! Simple, easy, and totally worth it! ^^Can you tell which one of the three oreos is the one with toothpaste?? My mom arrived on Saturday and Emily arrived yesterday morning just in time for Easter brunch! Once we picked her up from the airport, we headed straight to Silver Lake for breakfast. We went to a whimsical restaurant called Cliff’s Edge that from the outside looks like it wouldn’t be worth your time, but once you step through the entry way….you feel almost as if you are in a tree house! ^^Aren’t those pillows so cute?! ^^My cute Hannah Banana tagged along too…because she is family to me after all and I wasn’t going to leave her eating caf food on a special holiday! This week I took a break from Eggs Benedict to try Fried Chicken and Waffles. It was probably one of the most delicious dishes I have ever had. And I’m still day dreaming about every bite. Hannah had the berries and waffles! Emily had the Eggs Benedict (which I did taste just to make sure I wasn’t missing anything amazing…and I wasn’t. It was very tasty, just not the best ever). And my mom and Allie had a Bacon & Cheddar Frittata. Oh, and we had lemon ricotta pancakes with blueberry sauce on top for dessert! P.S. Happy Opening Day to all you baseball fans out there! I am wearing my Red Sox sweatshirt and my dad has his Red Sox tie on! We are so excited for this season and to leave last season behind us! 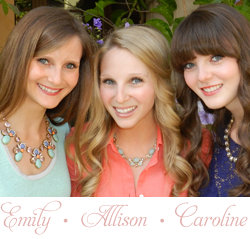 The Milly & Grace Girls Blog is a lifestyle blog about Emily, the owner of a cute shop on Nantucket Island called Milly & Grace, Allison, an actress living in Los Angeles, and Caroline, a college student (and future wedding planner) living in Malibu! We are three sisters, and the granddaughters of Milly & Grace. We are The Milly & Grace Girls! We would love it if you would come hang out with us!